We found this recipe in one of our most-used grilling cookbooks, Weber’s “Real Grilling,” as an accompaniment to their recipe for grilled flatiron steaks. It’s a simple and delicious way to dress up a steak, particularly if you’re a fan of olives. Come to think of it, this relish might also work well as a topping for tilapia or some other flaky white fish, or even as a condiment for a hot dog, similar to the Chicago dog. Certainly, each of these proteins are good on their own, but adding the fresh Mediterranean flavors of the relish can be a welcome change. 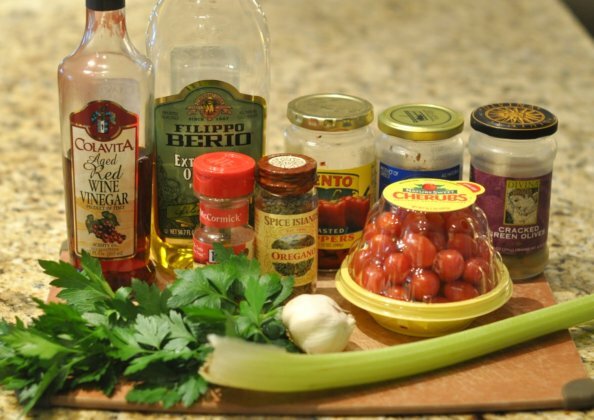 And since the relish is made with roasted red bell pepper, tomato, olives, celery and parsley, it has enough non-starch and non-meat components to qualify as a vegetable side dish in our book, thereby completing the meal. The recipe calls for pitted green and black olives. The green olives we used that night were not pitted, but it’s easy to remove the pits by placing the flat edge of a knife on top of the olive and smacking the knife to smash the olive. Then remove the pit. Obviously you can use whatever ingredient ratios you prefer, but the original recipe calls for 1 cup chopped roasted red bell pepper; 1 cup diced tomato; 1/2 cup each of green and black (we usually use kalamata) olives, quartered lengthwise; 1/2 cup chopped celery and 2 tablespoons chopped fresh parsley. Add the chopped ingredients to the dressing and stir everything together. The original recipe recommends making the relish 2 hours ahead of time and allowing it to sit at room temperature to help the flavors blend. We don’t always make it a full 2 hours ahead, but the flavors do develop and come together if you let it sit for a while before serving. Spoon the relish over the grilled steak and serve (with or without an additional side dish.) We love how the relish adds texture and fresh, brine-y flavor to complement the juicy, meaty beef. Grilled steak is delicious, but grilled steak topped with Little Italy Relish is delectable.